We do love seeing the Monarchs come back. But are you sure it is a Monarch? Or is it a Viceroy? Both of course are beautiful to watch. And they look so similar, nearly identical, does it really matter? Well, yes. Because the Monarch population is threatened by their only food source disappearing , so we would like to be sure that we are seeing more Monarchs. The Monarch feeds on milkweed as we all know. This makes them toxic to predators. Viceroy do not feed on milkweed so their numbers are strong because they are able to take advantage of the similarity to the Monarch and avoid predators. And unlike the Monarch who has been losing their milkweed food source, the Viceroy feeds on a variety of plentiful plants. There are actually several differences between a Monarch and a Viceroy. Viceroy are smaller than a Monarch, as much as an inch smaller wingspan. Monarch flight is quite graceful, part of the reason we love watching them. They seem to float with a flap and glide flight. The Viceroy flits much more quickly and erratically. Viceroy over winter rather than migrate. They can be seen a couple of weeks after the larvae emerges from the unfurling spring leaves of the willow or poplar tree. The monarch returns from Mexico and can be seen in southern regions ahead of the Viceroy, but may take until May or June to arrive in the Minnesota region and the Northeast. If you are paying close attention, you will see there is actually a striking difference in the pattern of their lower hindwing. The markings on the Monarch are lace-like. The Viceroy has a continuous black line across the hind wing. The difference is clear in the photos below. 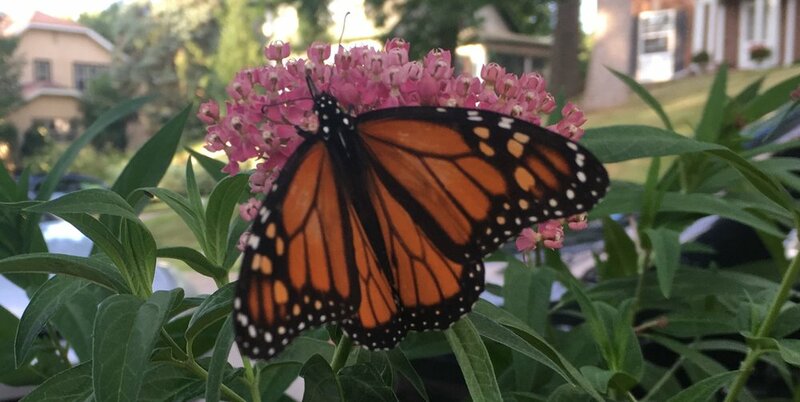 Plant some milkweed this spring and enjoy those monarchs!